You got quick questions, I got quick answers! 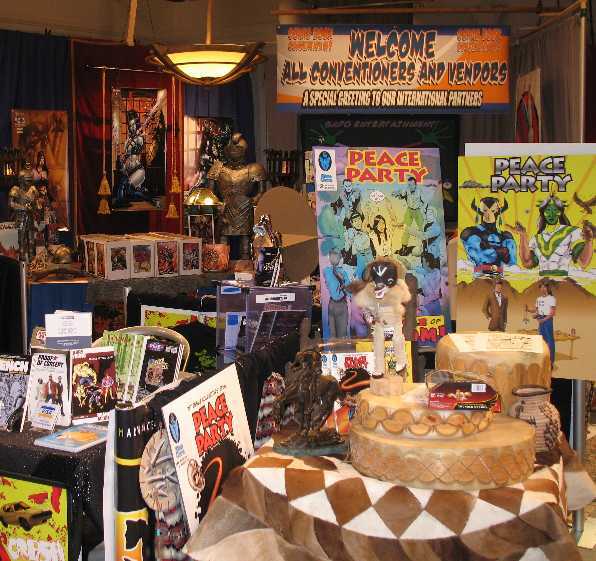 PEACE PARTY is the first in a line of smart superhero comics for a sophisticated audience. These comics are for those who are tired of mindless tales of mayhem, who appreciate adult characters who think before they act. "Comic book publishers must reach new readers with new kinds of stories," says writer/creator Rob Schmidt, "or suffer." In other words, I think a whole niche of comic books is going untapped. I'm talking about a book that's more mature, more real, than most of today's superhero comics. But also a comic that's more accessible, larger than life, than most of today's Vertigo-type books. I basically want to do a comic that approaches the medium's best work, the comics I love most. Those include such books as WATCHMEN, DARK KNIGHT RETURNS, Miller's DAREDEVIL, and the best of X-MEN and THE NEW TITANS. We're publishing our first issue this July. It depends on whether you mean when I filed a fictitious business name statement (last week) or when I conceived this business (eight-plus years ago). No way! Publishing my own book is daunting enough! Just the main one so far: Dealers are ordering the book in microscopic numbers. I think the industry has always seen small publishers as irrelevant, unless a small publisher came up with a hit, in which case the industry sees small publishers as a source of income. Yes, and rightly so, in many cases. Small publishers tend to have books with sloppy writing, murky art, and other production problems. Even if the book is impeccable, the storyline may be idiosyncratic—meaning it embodies the publisher's ideas but is weird or incomprehensible to the rest of us. I'd say few small publishers are trying to do what The Simpsons does on TV: make products that are fully accessible to kids but fully entertaining for adults. Yes, and some of it is understandable. I named the book PEACE PARTY rather than WAR PARTY, which is "different." My two heroes don't don costumes until issue #4, which is "different." They solve problems with their hearts and minds, not with their fists, which is "different." Some of it is just the natural reluctance of business people to try new products. We must realize retailers are operating on tight margins too. They can't waste much money on "experiments." When you look at a Previews catalog, with something like 1,400 comics in it, nothing stands out. No matter how good your comic is, it's lost in a sea of similar titles. Down the drain, unless they start publishing different and better comics. I just heard Marvel is planning a line of wrestling comics, which is the silliest idea since NFL SUPERPRO a couple of decades ago. "Let's give consumers a product that duplicates another product, but which isn't free and isn't as visceral an experience." Marvel may earn a quick profit, but does anyone want to bet how fast these comics will die? Comics can't outdo movies or video games with action. They can't outdo books or the Internet with content. If comics aren't to die, as they seem to be doing, they must do the stories they can do best. SANDMAN is a good example of a mythic series that needed both writing and art—that worked better than it could've in any other medium. My plans are to publish my first comic, PEACE PARTY, successfully. My dreams are to publish one or more comics like it—with different characters and plots, but the same themes and quality. I'd love to make money at this so it could be my life's work. I'll settle for breaking even and doing it on the side. We've been publishing since 1999. Officially there are only two issues, but I've also released a photocopied #0 and posted several new stories and features online. I've been working on a continuation of PEACE PARTY all this time, but I've had to corral artists to do the work, since I'm not a pro artist myself. So it's been slow going. Billy Honanie is a lawyer raised in a nontraditional, urban setting. He's an Indian intellectually but not emotionally because he's out of touch with his roots. His cousin Drew Quyatt is an artist raised on the reservation. Although he's a pop-culture enthusiast, he's a traditionalist at heart and practices the old ways. Between the two of them and their friends and family, we'll have a range of viewpoints: everything from mainstream American to traditional Indian to the "living in two worlds" between-state of many ethnic minorities. This will lead to a variety of conflicts between Indians along tribal, age, class, and gender lines. A good example of how this will play out is the beginning of the first issue, which you can read online at PEACE PARTY #1. It opens with the Hopi origin of the universe, which contrasts with the Christian story of Genesis that everyone knows. But to demonstrate that we aren't just pro-Indian and anti-white, it segues into a two-page argument between Billy and his Navajo friend Oliver. We also have the usual complement of minority characters: a black, a Latino, and so forth. And our stories will reflect the diversity of the Southwest setting, especially its Hispanic heritage. Do they? That kind of contradicts the whole idea of multiculturalism. And of being a multicultural activist. See my writeup at Why Write About Native Americans? Feel free to quote from it. Yes. You can find a list of my beliefs on this subject at America's Cultural Mindset. My Culture and Comics Need Multicultural Perspective essay is still my manifesto. No. I think it's inevitable that they'll adapt to some degree, since they're living in the midst of a pervasive and overwhelming cultural onslaught. They'd have to totally cut off contact with the outside world, as people like the Amish have done, to have any hope of remaining unaffected. But a lot of tribes began losing their "cultural distinctiveness" in the 20th century—ranging from the boarding school era in the early 1900s to the assimilation and termination phase in the 1950s and 1960s. The people were simply too poor to succeed in their reduced circumstances, so they gave up and left. Since the "Indian pride" era of the 1970s through today's gaming explosion, I'd say they've stemmed the tide of adaptation. While some tribes are selling out and becoming pure capitalists, others are using their newfound income to revitalize the languages and cultures they began losing decades ago. I'm not sure I buy the premise of this question. What makes you think "Natives abjectly rejecting their heritage" is a growing trend? How do small publishers survive? I'm doing a few things to address that question. One, I plan to publish more stories in the trade paperback format because of its obvious advantages. Two, I plan to reach beyond the comics market, which isn't particularly interested in Indian-themed comics, and target the Native and educational markets. Three, I plan to start a nonprofit company to encourage tribes to consider telling their stories in comic-book form. Well, Indians make up only about 1% of the population, so I wouldn't expect more than that. But I imagine the percentage is less than 1%. The reasons are probably about what you'd expect. Indian creators tend to live in more rural areas, have less education, come from more unstable families. In that case, they're less likely to be able to attend art school, visit a publisher in New York, or come up with the funds to self-publish their work. If you mean artists, I've thought vaguely about it, but I can't afford any "name-brand" talent. If I were rich, I'd probably hire the best I could afford. If you mean writers, few of them have the knowledge of or sensitivity to Indian issues. And even if they did, I'm a professional writer too. I'm trying to do the best possible comics, and from what I've seen, I'm a better writer than most of them. Mostly the former. I've been a huge fan of superhero comics every since I got my first Flash and Superboy comics in 1968. I own about 11,000 comics now and the vast majority of them feature superheroes. Yes, I've considered that. I think my comics will be pretty nontraditional as far as superhero comics go. They'll be more like CONCRETE, D.P. 7, or ASTRO CITY—some of my inspirations—than straight superhero comics like X-MEN, AVENGERS, or JUSTICE LEAGUE. Superheroes and related genres—the Star Wars type of sci-fi, the Conan type of fantasy—are dynamic and visual in nature. A scene such as Superman flying or Mr. Fantastic stretching almost demands to be illustrated. On the other hand, I've read several prose novels of comic-book characters and they work surprisingly well. I think a lot of superhero stories could be done in this format and I plan to do some myself. If I had to bet, I wouldn't bet on the future of traditional comics. Paying artists to create 24 or whatever pages or original art a month is simply too expensive. It's cost-prohibitive. I think computer animation tools will evolve to the point where non-artists can create many of the comics. Other comics will be done by cheap labor overseas. And others will evolve into illustrated prose or straight prose novels. I didn't sell many comics. I attribute that partly to not having my own table or a big display. And partly to the inherent dynamics of powwows. I think most people who attend powwows are touristy types who want trinkets—cheap jewelry, figurines, dreamcatchers, etc.—to remember their "Indian experience" by. They aren't looking for more in-depth information—which is why you don't see many books or videos being sold. And they aren't the hip young adult types who seek comic-book entertainment. The advisors are supposed to review all the scripts and ensure they meet the highest standards of accuracy and authenticity. They also answer any ad hoc questions I might have about Indian history or culture. They don't always respond to my inquiries, but they're a good resource to have on hand. One, I think it's tough to get minority comics published in general. See Some Thoughts on Minority Comics for more on that subject. Two, when it comes to Native characters, I think most attempts are too heavy-handed, lesson-oriented, and stereotypical. Few Native comics have hit the sweet spot between serious social issues and action/adventure tales. I think the X-Men comics hit this spot (mutant discrimination combined with deep characterization and larger-than-life plots). I hope to hit the same spot with PEACE PARTY and my other Native-themed projects. Probably. It's natural to use mysticism in Native comics because there aren't many sources for super-powers on the (stereo)typical rez out in the middle of nowhere. But if creators feel they have to use a mystical angle, they should try to do something new with it. Enough with the traditional grandfathers passing down secret super-power legacies to their alienated grandsons. It's some of both, undoubtedly. As I said, it's somewhat, er, natural to think of Indians and the supernatural. The traditional Indian talks of being in harmony with or linked to nature, the universe, the Great Spirit. If you want to do a pro-Indian comic, you want to reflect these values, so your heroes tend to have some connection to mystical forces. Similarly, if you want a hero to represent America, it's natural to wrap him in a flag and make him a patriot like Captain America. The question is not so much whether creators do it, but whether they overdo it. For your first few Native characters, it's understandable to give them a connection with the natural and supernatural worlds. But for the 10th or 100th Native character, it's time to do something new. Yes. Again, this could happen once in a while and be a refreshing change. But for most Native people, their heritage is a fundamental part of their lives. Not mentioning it is as stereotypical as overemphasizing it with warrior or shaman cliches. Yes, at least in mainstream comics. Characters like Wyatt Wingfoot, Red Wolf, Moonstar, Shaman, and Forge are all on hiatus. Manitou Raven and Echo have played a minor role in recent years, but nothing deserving mention in the grand scheme of things. The recent revivals of Rainmaker, Super-Chief, and Black Condor may signify a change, but they probably won't. We're working on completing the first PEACE PARTY story arc and putting it out as a graphic novel. We hope to get it done by the end of 2007. We're also soliciting Native writers and artists to do more Native superhero stories—featuring a team of heroes that will include the PEACE PARTY pair. We're planning on doing a big one-day event at the Eiteljorg Museum in Indianapolis next spring (stay tuned for details). And we're in the process of starting Turquoise Tales, a nonprofit organization to help tribes tell their stories via the comic-book medium. P.S. 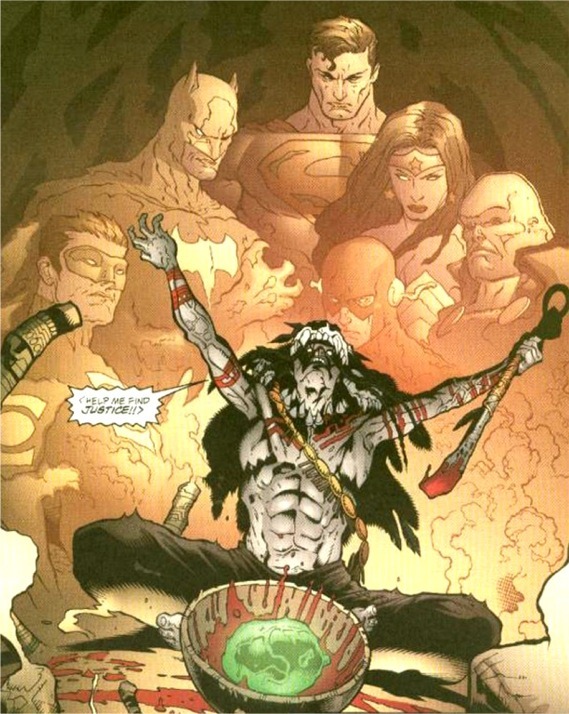 For Furey's article and my reactions to it, see Major Article on Comic-Book Indians.